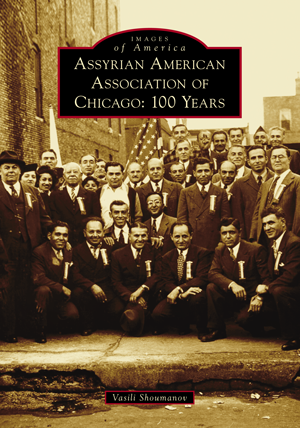 In 1917, the Assyrian American Association was founded and established in Chicago by those arriving in the United States in an effort to unite the growing community, aid newcomers, and celebrate cultural heritage. The first wave of Assyrians came to Chicago in the late 1800s. Their success prompted successive migration, particularly during World War I, when the Ottoman Campaigns incited massacres in Turkey and Iran and prompted survivors to flee. Although 100 years have passed, the organization remains a pillar of the Assyrian community in Chicago and a prized secular organization in the United States. Cultural activities such as shows and lectures by artists, sponsored by the association, are yet another means of bringing the Chicago community together for shared enjoyment. These pages are filled with old and new photographs that bring the organization's history to life and provide a firsthand look into the past and present. Vasili Shoumanov has a master’s degree in the history of eastern civilizations from St. Petersburg State University. He is a cultural director of the Assyrian American Association of Chicago. He is an author of several publications, including Images of America: Assyrians of Chicago (2001) and the Russian-Assyrian Dictionary, Pras-Atra Publishing, St. Petersburg, Russia (1993); he served as editor in chief of Homeland magazine from 1990 to 1996 in St. Petersburg, Russia.